File-magaine.com: "Steven McCarthy is a professor of graphic design at the University of Minnesota, Minneapolis-St Paul, USA. His long-standing interest in theories of design authorship - as both scholar and practitioner - has led to lectures, exhibits, publications and grant-funded research in over a dozen countries. His works of design authorship are in numerous prominent collections and his academic writing has appeared in journals devoted to design, typography, new media and education." Falcon Heights, Minnesota: Steven McCarthy, 2014. Edition of 50, 20 available for sale. 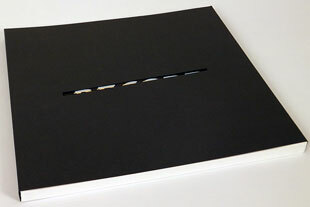 12.75 x 12"; 44 pages. Digitally printed on Mohawk Superfine text and cover using a Xerox 150. Archival matte dry ink. French fold with metal post binding on the left side. In open ended paper slip case. Signed by the author. Steven McCarthy: "Memories fade and are forever lost without documentation. While digital means of communication have accelerated the speed and number of exchanges between people, text messages, Tweets, and email messages primarily exist as ephemeral instantiations - brief, fleeting, of the moment, but rarely archived in long-term, tangible, and stable way. "While storing these messages electronically is possible, there are three major concerns. One, changes in device hardware and software make it challenging to access data over time (recall 3.5" floppy disks? Apple Macintosh OS 9 and earlier?). Two, the current trend for cloud computing and 'free' social networking makes data ownership, location, control and privacy unresolved issues. And three, it takes time and effort for people to filter their messages, organize them into a coherent narrative and archive them for posterity. "What form might best survive to be discovered in one's basement or attic many years from now? 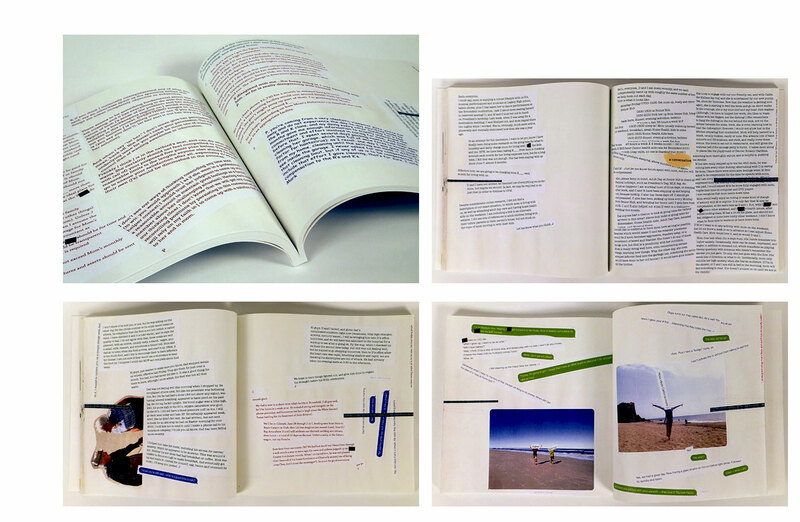 "This project, an artist's book in an edition of fifty, explores the undigitizing of electronic communication and fixing it in an analog medium. Ink on paper books, letters and cards - if kept moisture and light-free - have a life expectancy of many decades, even centuries. "Unbroken Record is a record of several conversations between myself and my family, none of whom thought that their words or pictures sent to me would be fodder for a creative project. This, I acknowledge, flirts with the ethics of privacy. Although anonymized for the book's broader readership, and edited for content prior to inclusion, it is conceivable that some will be unhappy that their thoughts were included without permission (even if sent as group messages)." [Falcon Heights, Minnesota]: Steven McCarthy, 2017. 22 x 14 x 9" closed, extends to 40". ; 30 pages including covers. Digitally printed in four color process. Each folded fore-edge filled with cotton batting. Bound into two strips of oak joined with three steel binding posts. Materials: cotton fabric, batting, thread, oak wood, steel bolts. Signed and numbered by the artist. 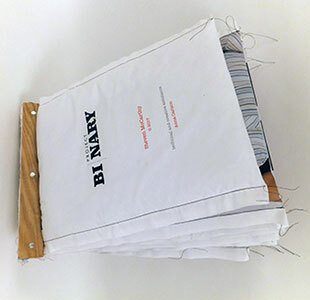 Steven McCarthy: "Project Binary addresses contemporary societal concerns about gender, race, class, religion, age, and other aspects of identity – aspects that are often polarized into 'on' or 'off' (or true or false) states. 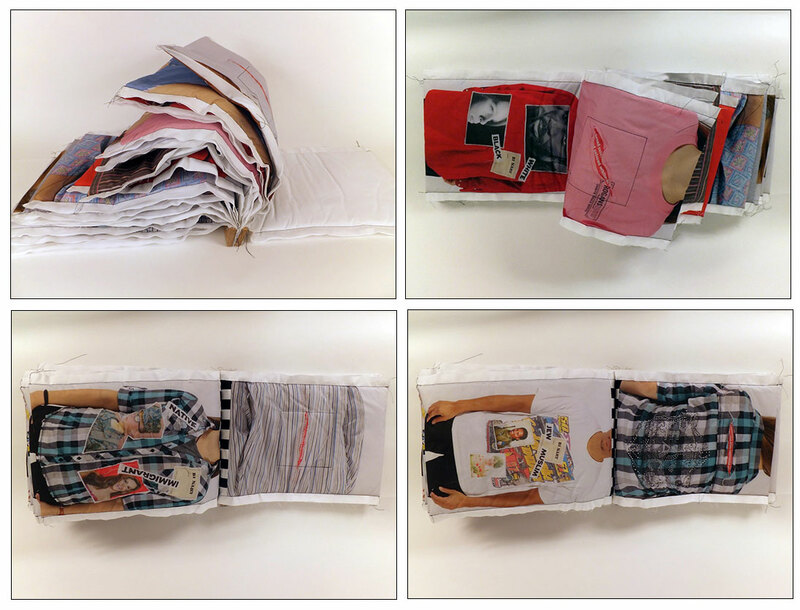 "The book contains a series of thirteen used garments that have been altered with images of faces and labels: black/white, man/woman, rich/poor, catholic/atheist, democrat/republican, cultured/uncultured, and so on. A couple of terms are not truly binary – genius/mentally ill for example – but play on misguided popular notions. "The faces were sourced by using the label as a keyword in a Google face image search with Creative Commons licensing permission for reproduction. "Each garment also has slurs for the labels literally cut into its back. Models wore the garments and were photographed front and back. These photographs were printed onto large pieces of cloth, folded along the fore-edge, stuffed with batting, and bound using two slabs of oak and three steel binding posts. "The pillowy softness and intentionally loose threads undermine ideas of polarity, of absolutes. And because each page verso has a pair of slurs, the harshness of language is heightened through contrasting haptic experiences."